ACTION ALERT: Against Support for Bullfights in the News! PLEASE SIGN ! Signed and noted thanks Simone. Thank you for posting ! - Signed Aug. 5. Noted and signed, thanks. :(..
God, what a horrible photo. This is what some people do for FUN?!? Michael, You signed on August 7, 2012. Noted and signed previously. Thanks. Noted and signed. Blatant callous cruelty - how in God's name can this be called entertainment. Oh, how horrible!! This is just so unnecessary. I don't understand why anyone would want to treat a living being this way~~they must be insane. Someone please protect these beautiful animals. They don't deserve this~~no living creature does. SIGNED!!!!! I hate this! 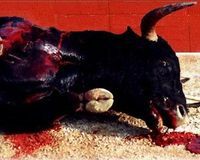 How can they celebrate the bull in Spain and then torture them to death? Seems skitzofrenic to me! Thanks for posting this so I could sign! I wonder how many petitions I have signed against this bull torture???? Already signed and shared. Thank you. Noted and signed. Thank you Simone. THE MATADOR MAINLY JUST "DANCES" AROUND THE OUTNUMBERED, INJURED, SOMETIMES HALF BLINDED BULL AND THIS THEY CALL BRAVERY !!!!!!!! I SAY, WHAT A COWARD!!! WHAT A COWARDLY SPORT!!! Truely a stone age mentality. Supporters should be ashamed! Signed. Bullfighting is disgusting and barbaric beyond words. Signed on August 5, 2012.